General Impact offers a variety of tinted glass to protect your interiors from the damaging effects of UV rays. We also offer Low-E coated glass to reduce heat build-up that lead to higher energy costs. Not only is it the smart thing to do, it’s also the GREEN thing to do. General Impact windows and doors protect your residential and commercial properties 24/7 against the ravages of storms, forced entry, sound transmittance and water and air infiltration. 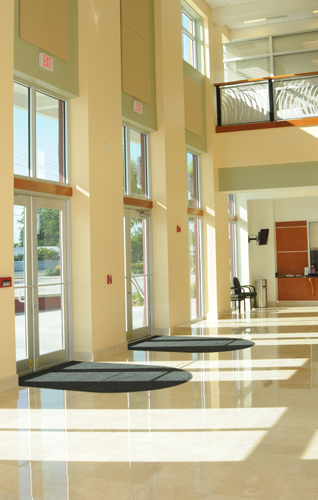 Our laminated glass products reduce these effects by 50% compared with a single pane of glass. Our thick aluminum frames are made with stainless steel hardware and assembly components. Our wet glazing with our premium structural silicone 795 or 995 Dow Corning™ adds significant strength and durability. General Impact windows and doors are designed and tested to withstand large missile impact and maximum design pressures that are available in large size configurations. Not all manufactures make strong products like General Impact and at the most competitive prices in the market.